Former UN Secretary-General Ban Ki-moon will set up a non-political, non-profit organization with the aim of reducing poverty and conflict. 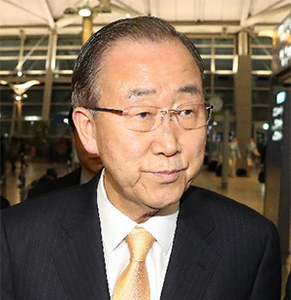 "It will be like a small UN in Seoul," a Ban aide said Wednesday. "It will be smaller than the real UN, of course, but we will share the same vision and work to end poverty and achieve conflict resolution in Korea, for Koreans, in Korean style." 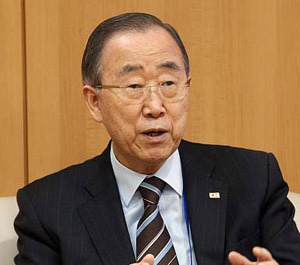 Ban told the Chosun Ilbo on Wednesday, "I worked hard to raise awareness of issues like climate change, sustainable development and women's rights in my 10 years at the UN. I now want to work with Korean people of various backgrounds to achieve these goals." "This will be strictly a non-political and non-profit organization. We will not be linked to the government or any political party, and collaborate with civic groups and academia, and international organizations," he added. Kim Sook, a former Korean ambassador to the UN who has been involved in establishing the organization, said, "It's been two years since Ban left the UN, but he is still active in various international organizations. We want to contribute to making Korean society better, using Ban's knowhow and networks across the globe." The launch will be held at the Korea Press Center in Seoul on March 5 and attended by dozens of notables, including former Prime Minister Kim Hwang-sik, former Foreign Ministers Gong Ro-myung and Yu Myung-hwan, and writer and relief worker Han Bi-ya.